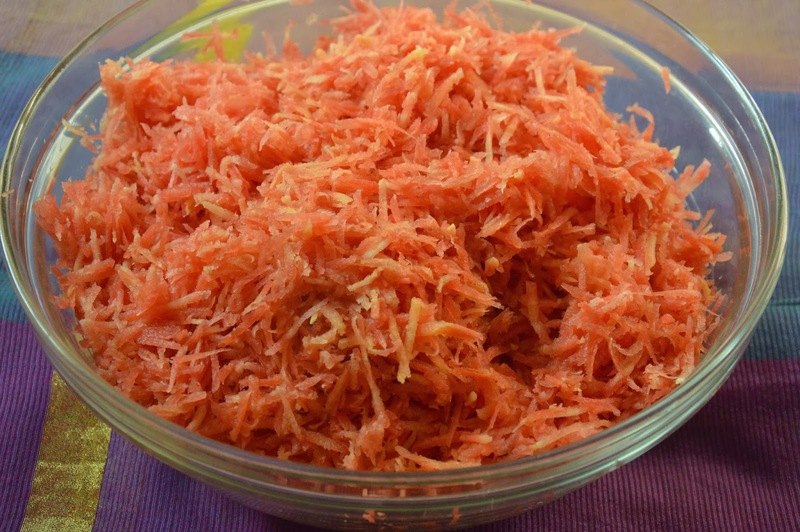 It started towards the end of October - as the weather cooled in the north I saw picture after picture of the delicious red carrots flooding every food group board on Facebook and more often than not, people were making gajar ka halwa with those carrots. 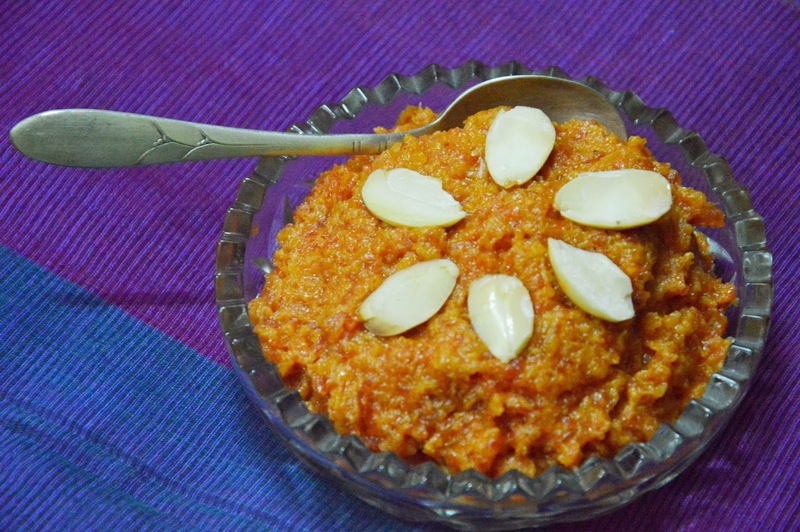 I have always disliked Gajar ka Halwa. Once again I have a seemingly stupid reason for my dislike. My dad liked to cook and as most men, especially in those days, he was not into making mundane daal, bhaat, torkari, but liked to cook up the fancy and complicated stuff. The fact that slave labour (me) was available inhouse was an added benefit, I'm sure! And so gajar ka halwa featured often. I would be duly sent upstairs to our neighbour's house to get their grater. It was a big red plastic bowl with a white grater that fitted on as a lid. 30 years ago it was unusual and uber cool. Anyway, I hated that grater because I'd be the one stuck grating that mountain of carrots. Okay. Honestly, it was probably just a kilo of carrots but to a 9 year old it was a mountain. I'm not surprised that I remember nothing about the process of making the halwa apart from the grating. I seem to have deleted it all out of my memories! 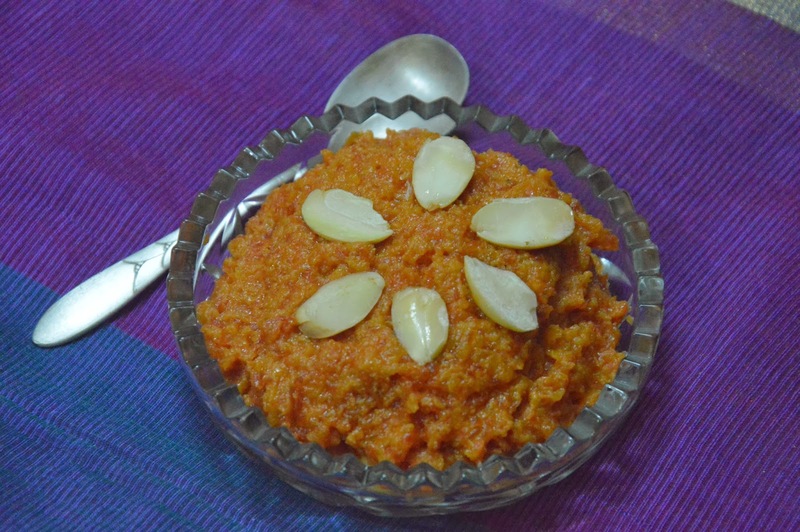 Having seen tons of Gajar ka Halwa posts on Chef at Large on Facebook I asked for a recipe. The answers were instantaneous and I had a whole load of fool proof recipes to choose from. Ultimately the Hubby selected one that he felt was the most authentic one and it appealed to me too because it had no short cuts.I like to do a recipe the correct way the first time and only after that pare down the method for an easier version for future use. Thank you Harpreet Bedi Chadha for sharing your recipe. 5 green cardamom, seeds removed and reserved. 20 raisins and 10 cashew nuts for garnishing. 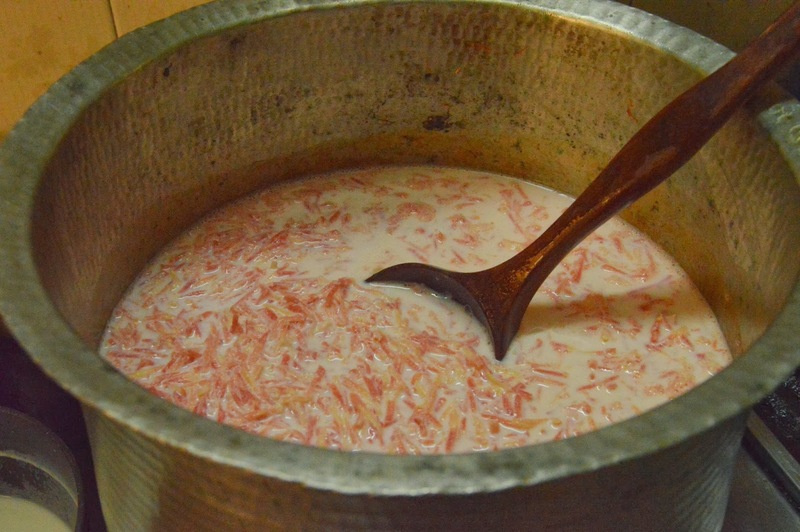 Take a thick bottomed largish vessel to make the halwa. 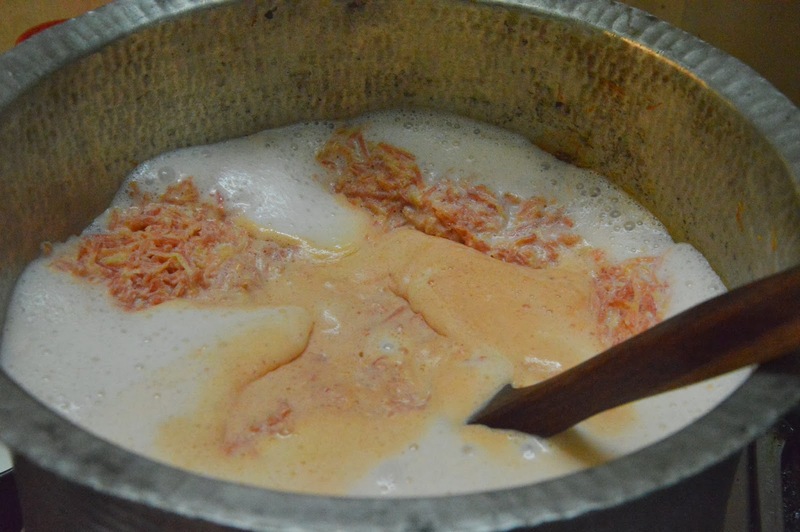 Put in the grated carrots and the full fat milk and bring both to a boil. Pound the cardamom seeds gently in a mortar and pestle or under a rolling pin and add them to the boiling carrot and milk. Reduce the flame and let the milk get absorbed into the carrots and reduce. Stir every few minutes ensuring that it doesn't stick to the bottom of the vessel. This is going to take a few hours so there is no option but to be patient. Keep stirring every five minutes or so. In the mean time you can peel the blanched almonds and halve them. Put them aside. Heat a little ghee in a separate pan and fry the almonds very lightly. If you're using raisins or cashews, fry them too. Drain out the excess ghee and leave these aside. 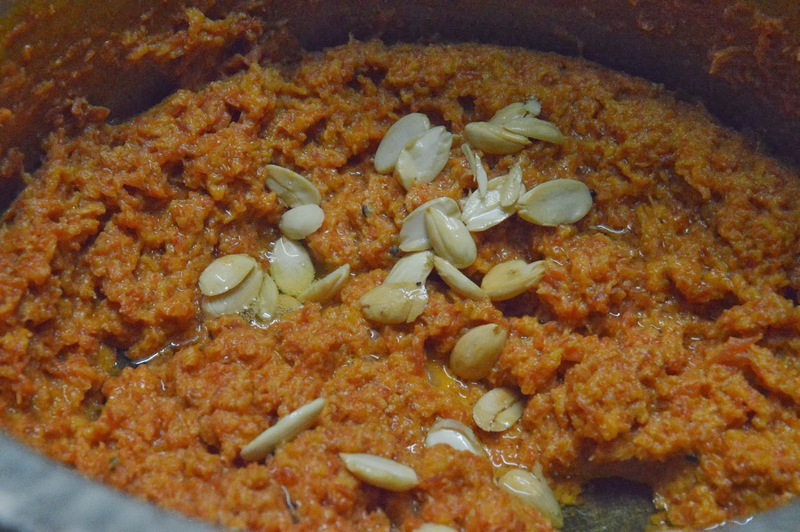 Eventually the milk in the carrot-milk mix will reduce and you will get to the final stages of the halwa. Add the sugar and stir well. 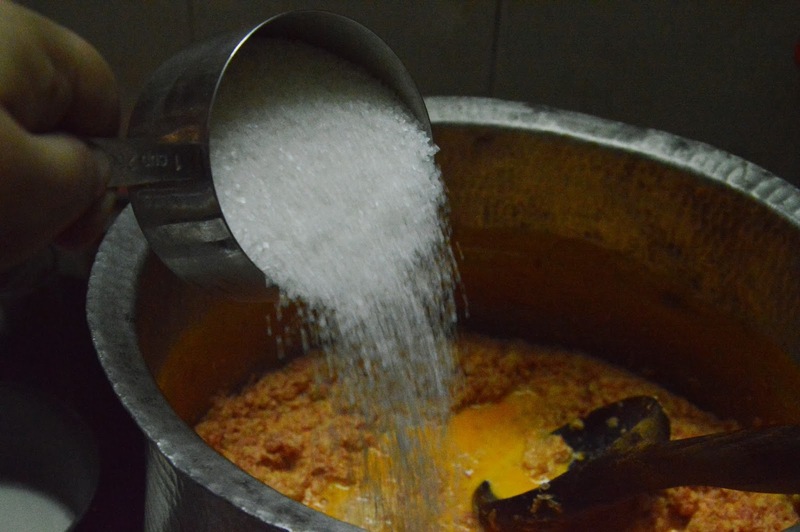 The sugar will dissolve and the halwa will get watery again. 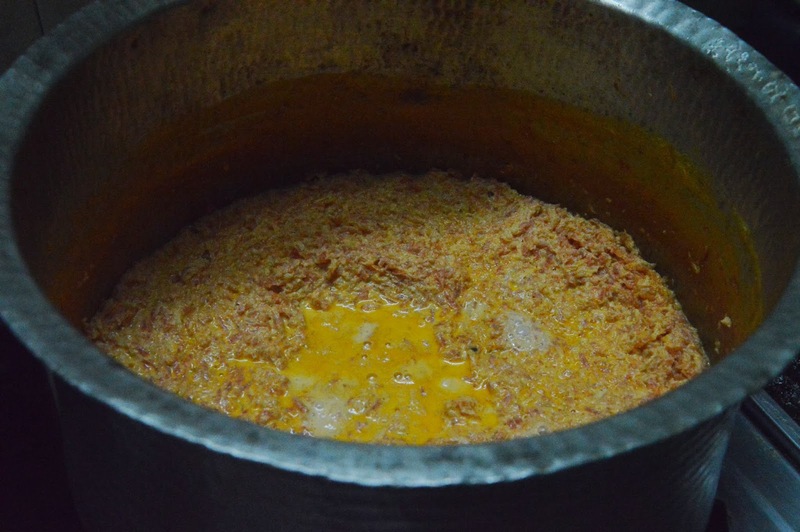 Stir away patiently till the halwa reaches a nice thick halwa-like consistency. If you like you can add a few of the raisins and a few nuts (chopped) to the halwa. Pour in the ghee too. Mix well and your halwa is ready. Remove to a pretty bowl and decorate with the remaining nuts and raisins.